The Appalachian Voice team delivers 61,000 copies of each print publication throughout eight states and Washington, D.C., and mails over 1,500 copies directly to our members. 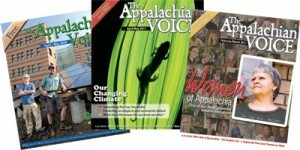 Members of Appalachian Voices receive a one-year subscription to The Voice, delivered each issue to their mailbox. In honor of the organization’s 20th Anniversary, memberships to Appalachian Voices are just $20 throughout 2017! Fill out the form below, and you should receive your first copy soon!